Students hope to break 20 year record of 45 mph over a 310 mile course. This particular car is covered with solar cells as shown in the picture. While not esthetically pleasing, the objective is to show that this technology will work and will provide power over longer distances and also higher speeds. if perfected, the esthetic issues can be dealt with later to get it ready for mass production and for the public in general. The real challenge will be to not add weight to the car while improving the esthetics. It also begs the question regarding why more vehicles do not use solar technology. For example why does the Toyota Prius not include solar panels to augment the electrical power generation in the brakes and transmission etc.? Overall mileage could be drastically improved we believe if solar technology was included in cars like the Toyoto Prius. 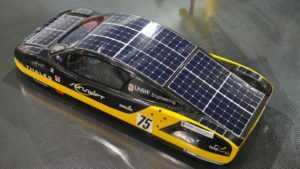 back to the Sunswift Eve Solar Powered Car, which is really the subject of this post. Exact facts and figures we cannot quote until the FIA has undergone ‘homologation’ or official verification of the record attempt. They will update the details in due time. Our car traveled at over 100km/h for the distance. Subject to verification from CAMS (Confederation of Australian Motor Sport) we may qualify for additional Australian land speed records for 100km and 500km electric cars. We are the first FIA World Record set in Australia since 1984. We are the first Australian record since 1994. During a practice test run we achieved eVe’s top speed to date of 132km/h. Is this the wave of the future? Who knows, but it is fun to keep track of these kinds of trials and tests to see what is being developed and what will make it to the factory floor for mass distribution.